The introductory blurb for F. Marion Crawford’s The Screaming Skull (1908) describes it as an early example of the modern monologue (noting that it verges on the stream-of-consciousness at times). This form suits what, at first glance, would appear to be a ghost story. Braddock, the narrator, has inherited a property in tragic circumstances; the previous owner (his cousin, Pratt) died a death shrouded in mystery, his throat bitten out by an unidentified creature. Pratt’s body, found on the beach, had a box containing a skull next to it. Since he was found killed, this had been returned to the house and, apparently, largely forgotten. This provides the background to the story. Crawford’s decision to tell the story in the way that he has allows him to play with the reader. Braddock opens by telling his companion (an old friend) that he has often heard the skull scream. He rejects the idea that he is a superstitious man, suggesting that we should not question his account of events. However, as the story moves on, it becomes clear to the reader that the reliability of his account could be in question. He seems in no doubt that he and the servants in the house are hearing the terrifying screams made by the skull. That others hear them is, of course, essential for Braddock if he wishes to maintain his grip on reality. From a declaration that there can be no supernatural carrying on, he notes that the screams are as clear as ever, even when only his deaf ear is uncovered. This opens us to the possibility that the screaming could be a manifestation of Braddock’s guilt. Some years before, Pratt’s wife had died in mysterious circumstances. The presence of materials, including a spoon which may have been used to transport molten lead and the fact that the skull rattles, points to the possibility that Pratt killed his wife by pouring molten lead into her ear. Braddock feels guilt for this because he told a gruesome story about a woman who murdered her husbands by doing so. That Braddock fears that he may have inadvertently caused someone’s death is not in question. That this person is wreaking revenge from beyond the grave by killing her murderer and then beginning to torment the man who gave the means to him is more questionable. Granted, these questions arise mostly through Braddock’s refusal to admit that the events he is relating would seem to point to both foul play on the part of Pratt and vengeance from beyond the grave. The lack of credulity in Braddock means that, even as it becomes clear that something odd is afoot, he refuses to believe the evidence of his eyes. Normally, this is something of which I approve. Would that more would reject charlatans who prey upon the weak and the gullible, inventing stories of guardian angels and spooks while rejecting the wonder that surrounds us nature. However, in the context of this story, Braddock’s unwillingness to accept the supernatural explanation becomes a pigheadedly irrational stance to take. After all, he is witness to the skull (complete with rattle) making its way back to the house after his attempt to dispose of it. 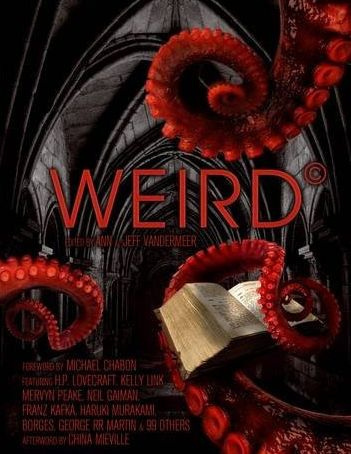 The Weird has, after a strong opening with the Kubin story, maintained its fine form. The Screaming Skull is an excellent and, I think, quite an unusual ghost story. Of course, plenty of supernatural fiction has a psychological element, but I think that Crawford handles it in a way that sets it apart from its peers. Of course, it is also possible that I just haven’t read enough horror. This entry was posted in Review and tagged ann and jeff vandermeer, f. marion crawford, the weird. Bookmark the permalink.